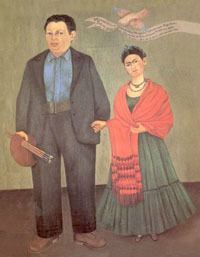 Mexican painters Frida Kahlo and Diego Rivera are passionate artists, idealistic Communists and eternal soulmates. But Kahlos physical suffering from a streetcar accident and Riveras constant philandering create a canvas of high drama, fueling their tumultuous marriage and brilliant careers. Set against the vivid backdrop of post-revolutionary Mexico, as well as vibrant scenes in New York, Detroit and Paris, Frida & Diego is filled with fascinating characters that include Henry Ford, Nelson Rockefeller, Leon Trotsky, Pablo Picasso and other big-name contemporaries of the day. Combining elements of magic realism, ribald humor and deep, emotional poignancy, the show delves into the multi-hued escapades of this colorful couple -- their love and obsession with each other, their work, their politics and their shocking extramarital exploits. Frida & Diego has 20 unforgettable songs, from lively Latin rhythms to haunting Broadway ballads. Musicians...actors...we are casting! Click here. ©2002 fridaanddiego.com. All rights reserved.